Your little muffin will have room to grow in this sweet and ruffly Layette Gown Converter! This outfit grows with your child and will keep your little one snug and cozy. The Ruffle Layette Gown Converter comes with a matching hat! What could be better? 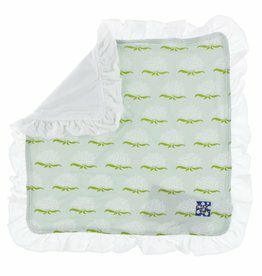 Pair with a coordinating Ruffle Blanket for an extra special shower gift!